It was a long taxi ride from Dar es Salaam center to the Steers hamburger restaurant outside town, and we were already late. What seemed to be a disastrous start to an interview turned out to be the beginning of a very exciting journey through the lively Tanzanian hip-hop scene. I was curious to meet them, Tanzania's Top of the Hip-hops. 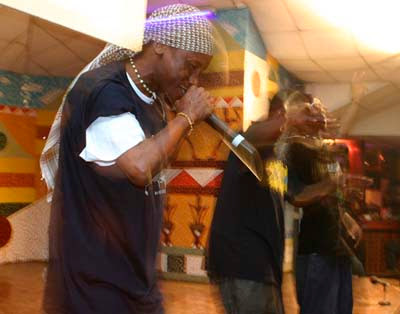 As it turned out it was all very easy; the hip-hop community in Dar es Salaam is small and friendly. Different from what I expected, most artists do not have a manager or agent who deals with the media. From the first contact it was a very personal encounter. In just one week, photographer Lydia Martin and I went to see more then ten of the hottest artists and groups in the hip-hop scene, producers and promoters. I was amazed how ambitious and professional the artists are. It was my second time in East Africa, and not knowing much about Tanzania's music industry I had not expected to find hip-hop such a big business. Most of the artists have been working successfully in the music scene for more than five years, and Tanzanian hip-hop, better known as Bongo Flava, continues to grow in popularity. TV and radio programs are dedicated to Bong Flava, which is also reflected in the sales figures of some of hip-hop albums, eg. T.I.D's album Sauti ya Dhahabu sold over 200,000 copies in Tanzania alone.